Kevin MacLeod took part in a gem for Southern Oregon in 1988. MacLeod started the game for the short-season Northwest League Athletics and another pitcher finished the game. Between them, MacLeod and the other hurler combined against rival Everett to throw a no-hitter. MacLeod took part in that game in his second pro season. He went on to see time in four pro seasons. He never made AAA. MacLeod's career began in 1987, taken by the Athletics in the 10th round of the draft out of the University of Toledo. He went to Toledo after growing up in Nova Scotia. MacLeod made the Nova Scotia Sports Hall of Fame with the 1985 Kentville Wildcats baseball team in 2013. MacLeod made the team hailing from Sydney, N.S. He then played at Toledo from 1985 to 1987. With the Athletics, MacLeod started at short-season Medford and single-A Madison. He got into one game at Medford and 10 at Madison. Between them, he went 2-3, with a 4.80 ERA. He moved to Southern Oregon for 1988, participating in that no-hitter while starting 15 games. He went 9-1, with a 2.89 ERA. 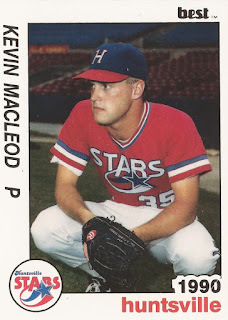 MacLeod played 1989 between Madison and single-A Modesto. He then hit AA Huntsville in 1990. He got into just six games there, starting three, and turning in a 5.14 ERA. He then finished out his career with the Cardinals that year at short-season Hamilton. In 29 relief outings, he went 1-1, with a 1.47 ERA and three saves.